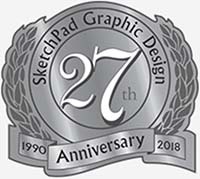 For over 27 years, SketchPad Graphic Design has been providing affordable, professional design services in Ventura County. We specialize in both graphic design and website design. We are proud of our web design portfolio that showcases the work we have done for clients across many industries and professions. Our graphic design portfolio includes the logo designs, brochures, and other print design services that we have done over the years. We have the right solutions for all of your design needs. We are a U.S. Veteran owned business. We take the time to get to know you and your project by understanding your graphic design and web design needs and goals. Only then can we assist you with your logo design and or business cards, fliers, brochures or website design, and any other marketing materials you are looking for. IMPORTANT! The person you talk to at SketchPad is the person who will be doing the work. We don't stop until your job is done the way you want it. Many of our clients lost large investments when their previous designers skied up on them. We won't do that. We've been designing for 27 years! We are deadline-driven professionals. We never disappoint. We know what it takes to launch a product or business, and to grow an existing business. After all, we were doing that before the dot.com world dawned. We pledge to give you superior marketing materials. We're boutique. We give each client the personal attention and time they deserve. And, we have the graphic design skills and experience to carry out our pledge. That's what you want right? We strive to be easy to work with. We hope you will give us a chance to be part of achieving your goals. If you would like to see more of our work, please check our our design blog which contains a lot of our completed web design and graphic design work. We're really pleased that so many of our early clients are still with us. We welcome you to join our growing list of satisfied clients. I reached out to Larry at Sketchpad to help me with a high-exposure advertisement. I knew right away that we could work together. Larry is very approachable, he listens before making recommendations and I really appreciated his patience with me! In the end, I love the ad, and the overall experience was a positive one. The price was very reasonable, I even paid him more than he asked for because I was so pleased. I will absolutely ask for his help again in the future and I sincerely recommend him to anyone looking for guidance in graphic design. I would like to thank Larry and Norma of SketchPad for their expertise and professionalism in designing my web page and various promotional materials. When I first started my business, I looked at many web designers. From the beginning Larry and Norma worked promptly and I loved the fact that they were a local business. I have had many people compliment my web page and business cards, and highly recommend SketchPad for any new or existing business! Those of us who work with SketchPad would like to commend them on their outstanding and professional work. Recently we had an expert in marketing museums come to the Rancho Camulos Museum. When she saw our School Tours brochure that SketchPad created for us, she was very impressed. She stated that she would like a copy to use as a sample of how to capture the public’s attention to the value of museum school tours. We pass along the compliment and appreciate all of SketchPad’s hard work to create event flyers, rack cards and other advertising for the Rancho Camulos Museum. I have had Larry and Norma do our website from inception, development, and creation. They have always been very helpful with suggestions and creative improvements to make our web page work for us. We are constantly getting customers into our store who have found us through our web page. They are very prompt at getting revisions done. They are nice to work with! SketchPad was a great move to make for my company. Larry built our website quickly but with quality. He took our ideas and ran with it. Came back quicker then I had anticipated, and asked for thoughts, changes, suggestions, and questions. He stayed on top of us as the customer and his communication is second to none. He built exactly what we wanted and better yet, exactly what we needed. The best part about it, I can call at any time, with any questions, and his knowledge is always there to help. I highly recommend SketchPad! SketchPad made the whole website creation process just plain easy! I received quotes as high as $10,000 (complete with the corporate run-around) to produce my website. SketchPad's down home hospitality, service, depth of knowledge, willingness to help and many creative insights made my website a hit for both me and my clients. It has made a world of difference in the professionalism and, frankly, the profitability of my company. From content to colors to hosting - I highly recommend SketchPad. As you can see here, SketchPad was not the first graphic designer in Southern California...but, we were not far behind.